My number one frustration with false teachers is their refusal to be guided by the harmony of Scripture. Notice these two passages. Are they contradictory or complementary? There is none who seeks after God.'" "Then Peter opened his mouth and said: 'In truth I perceive that God shows no partiality. But in every nation whoever fears Him and works righteousness is accepted by Him.'" "But Jesus called them to Him and said, 'Let the little children come to Me, and do not forbid them; for of such is the kingdom of God. Assuredly, I say to you, whoever does not receive the kingdom of God as a little child will by no means enter it.'" And what about David's words in Psalm 51:5? Did He intend for us to conclude that babies are conceived as sinners and, therefore, born sinful infants? Or is it possible that He was using rhetorical overstatement to expose the impact of sin on the entire human sphere and emphasize our lack of excuse? It is one thing to be born into a realm governed by Adam's nature (innocence removed), it is quite another to suggest that babies inherit Adam's guilty sentence. 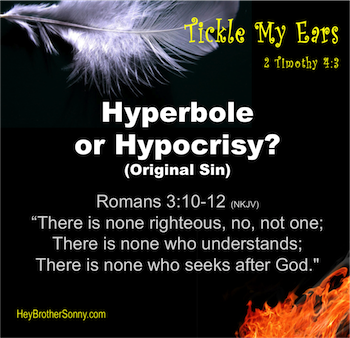 When reformed theology bases its doctrine of original sin on rhetorical overstatement without filtering them through the rest of Scripture, they make God look like a hypocrite. There can be little unity among Christians as long as human doctrines dominate and selective obedience governs hermeneutics (principles for interpreting Scripture). Only by submitting to the harmony of the whole counsel of God can we correctly handle the Word of truth. We must raise our sights higher than the teachings of men. Back to Top of "Original Sin, Psalm 51:5"